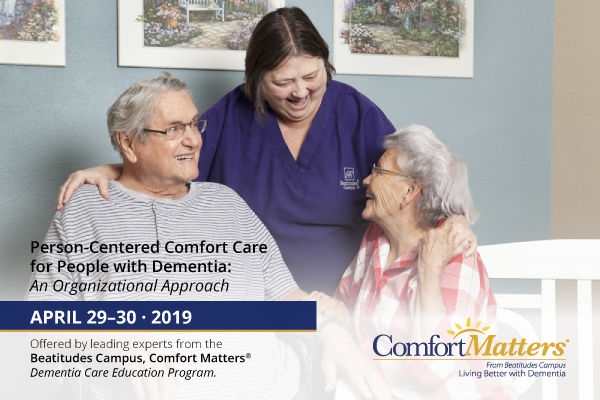 Offered by leading experts from the Beatitudes Campus, Comfort Matters® Dementia Care Education Program. Cutting edge dementia care and service, is your organization up to the challenge? Person-Centered Comfort Care for People with Dementia: An Organizational Approach is an evidence-based course designed to assist healthcare leaders develop and implement a person-centered comfort care program in their organization. The course uses organizational assessments and leadership exercises to assist participants in adapting their organizational culture to deliver positive outcomes for people with dementia, their families and staff. Tailored specifically for Executive Directors, Administrators, Nursing Directors, Social Work Directors and Assisted Living Directors.